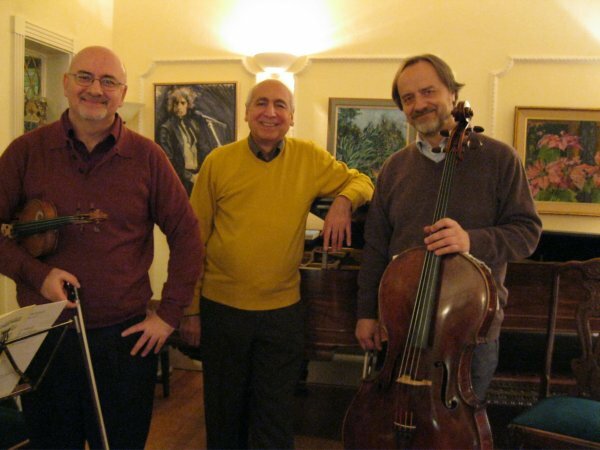 The Rosamunde Trio, formed in 2002, has toured extensively in the UK on over twenty-five occasions and has also performed in festivals and major venues in the USA, Ireland, Germany, Italy, Slovenia, Cyprus and the Czech Republic. In 2012/13 the Rosamunde celebrated its tenth anniversary with cycles of the complete Piano Trios of Beethoven. Following the enormous success of these concerts, the London Chamber Music Society invited the Trio to do an even bigger series at Londons Kings Place devoted to all the Mozart Trios and the great works of the 'French School'. The day after our concert they will perform the same programme at Kings Place to celebrate the precise day of the Armistice centenary. Martino Tirimo was born into a musical family in Cyprus and as a child prodigy appeared both as pianist and conductor, at twelve conducting La Traviata seven times with soloists from La Scala, Milano. At sixteen he won the Franz Liszt Scholarship to the Royal Academy of Music, later completing his studies in Vienna. He came to world attention in 1971/72 when he won the international competitions in Munich and Geneva and has since appeared frequently with the major UK and overseas orchestras, with conductors such as Barbirolli, Boult, Masur, Sanderling and Rattle. He has given numerous series devoted to Beethoven's thirty-two sonatas, Schubert's twenty-one sonatas, and Robert and Clara Schumann's principal works, In 2010, in celebration of the two-hundredth anniversary of Chopin's birth, he gave more than a hundred concerts performing the composer's complete works, ten of them at London's Kings Place, to exceptional critical acclaim. The Arts Desk described it as a colossal feat and Tirimo as Kings Place's hero of the year. In 2015 he performed all the major works of Schubert and after the first concert Classical Source wrote that Tirimo has the uncanny ability to make the audience feel it is in the very presence of the composer. He teaches at Trinity Laban Conservatoire and has given masterclasses for over forty-five years at Morley College and elsewhere. Lithuanian-Israeli violinist Ben Sayevich began his studies at the Churlonis School for the performing Arts in Vilnius. His teachers have included Felix Andrievsky, Dorothy Delay, and Eric Rosenblith. He has performed extensively throughout North America, Europe and the Far East and has appeared on radio and television both as soloist and chamber musician. Sayevich was Professor at the University of Kansas from 1987 until 2006, and is now Professor of Violin at Park University in Kansas. His other posts have included the Concert Master position of the Kansas City Camerata and the Kansas City Chamber Orchestra, with whom he has made numerous concerto appearances, including Violin Concertos of Vieuxtemps, Glazunov, Mozart, and Beethoven. Daniel Veis has been widely recognized as the finest Czech cellist since winning the Silver Medal at the prestigious 1978 Tchaikovsky International Competition in Moscow and also the First Prize at the Prague Spring International Competition, a competition previously won by Rostropovich. He was born in Prague and studied there at the Academy of Performing Arts as well as at the Moscow Conservatoire for five years, with Natalia Shakhovskaya. Since 1979 he has performed regularly as soloist with many of the major orchestras with conductors such as Sir Charles Mackerras, Serge Baudo, Gaetano Delogu, Yan Pascal Tortelier, Jukka-Pekka Saraste, Vaclav Neumann, Jiri Blohlvek, Libor Pesek and many others. In 1989 he had the honour of being appointed permanent cello soloist of the Czech Philharmonic Orchestra. In addition to his solo career he has been a professor and also vice-dean at the Academy of Performing Arts in Prague and for fifteen years was a member of the Dvorak Piano Trio, with whom he toured and recorded extensively.